This kit comes in a gelcoat finish but painted to match is optional. Seat cost and options vary and are not included in basic kit price. 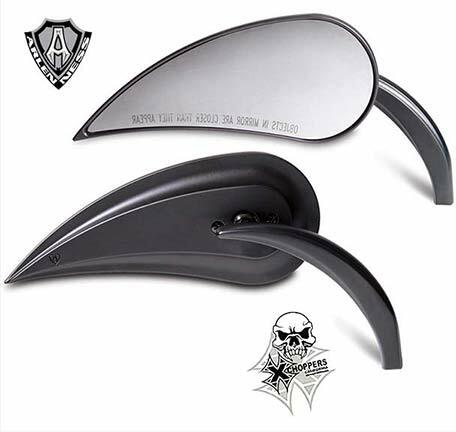 Fiberglass rear fenders available in Gel Coat Finish or, factory Color matched painted also available. Please call Xchoppers for quote on colors not listed below in options). 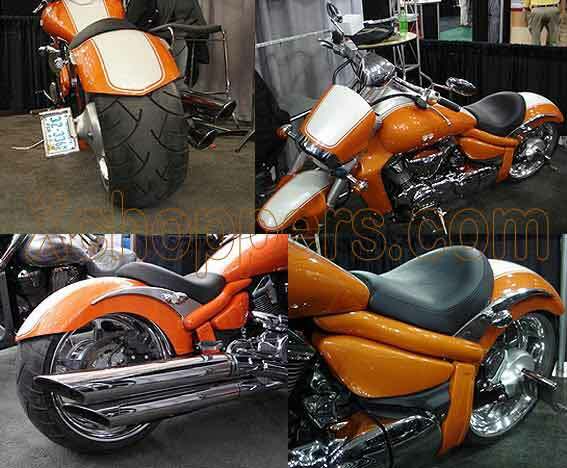 Fenders are no longer available with rounded rear shape (shown on black bike) but the pointed style as shown on orange M109 is still being offered. See options below. Polished or chromed Billet Fender Struts. 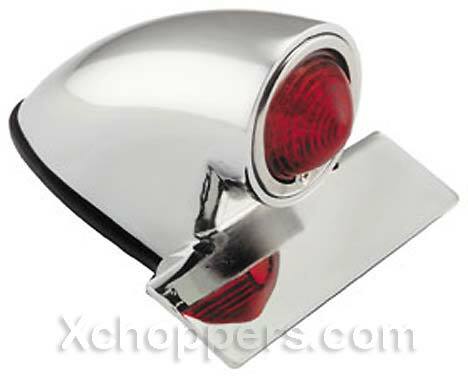 Polished is standard, add $85.50 for chrome (see options below). 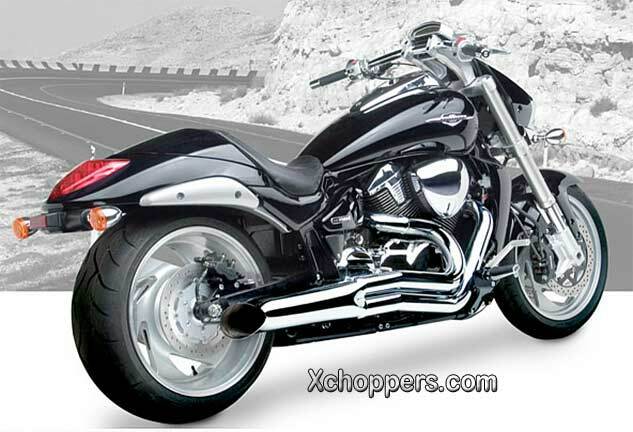 Xchoppers Black bike is shown with polished struts. 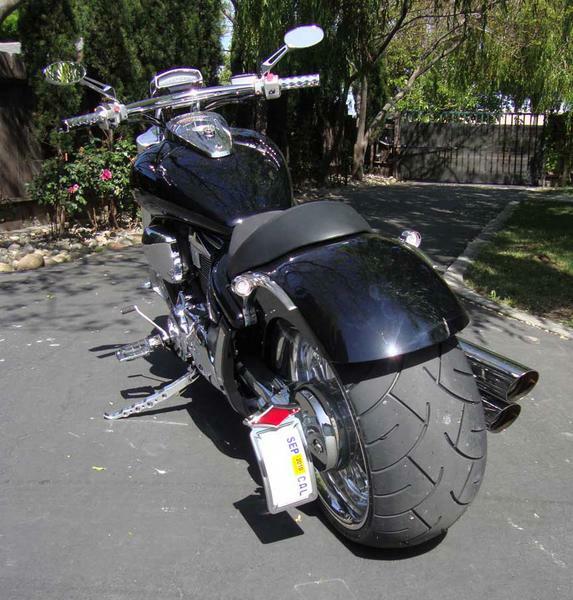 Xchoppers M109 with Sumo-X, 10" wide rear wheel, Avon 300 tire and Sumo-X custom fender shown below. Swamp Works 300 tire swingarm was used with 300 tire. 280 tire was mounted with stock swingarm. Call 209-833-6174 for details. Shown with Avon Cobra 300 above. Shown with Metzeler 280 below. Shown above with stock height rear suspension. Orange bike is shown with air shocks in lowered position. Lowered look can be achieved with air suspension available from Xchoppers.com on this website. Fender and struts are all included in the fender kit price. Sumo-X seats as shown and 2-up versions are available separately. Paint costs vary, chrome struts are also an extra charge. 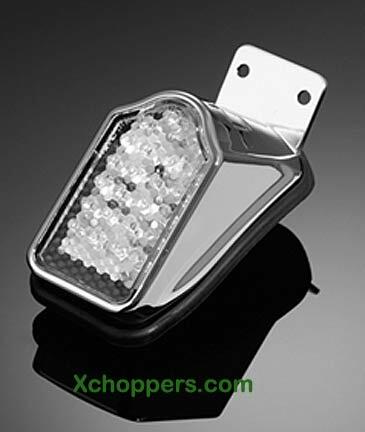 Please email Xchoppers for quotes on your kit. 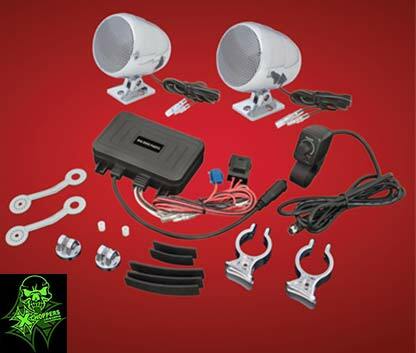 Estimated install time on these components is about 30 to 60 minutes. Fender kits come in ready to prime, gelcoat finish or Painted to match original Suzuki colors as listed in options below. For colors not listed, please call or email Xchoppers for a quote. Sumo-X Solo & 2-Up seats available from Xchoppers.com (required for installation). 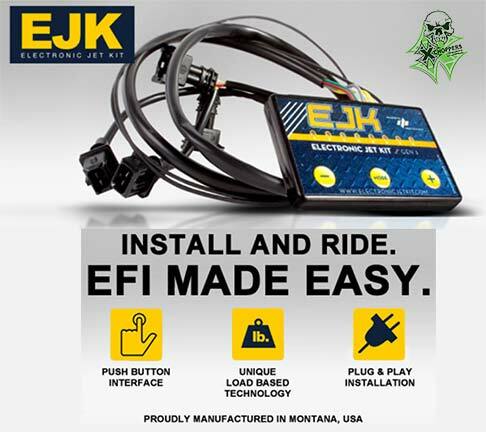 Email us for a quote on a complete 280-300 kit or for just the components you need. 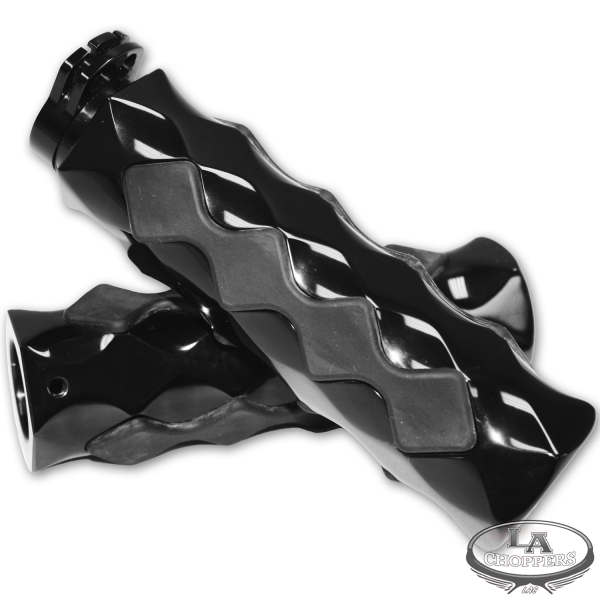 RC Components and Sumo-X custom wheels are available from Xchoppers. 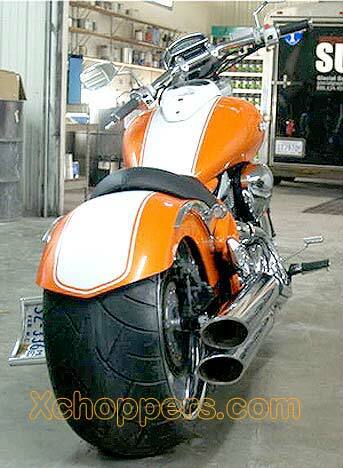 Order now and be one of the first in your area to sport a huge rear tire on your M109! 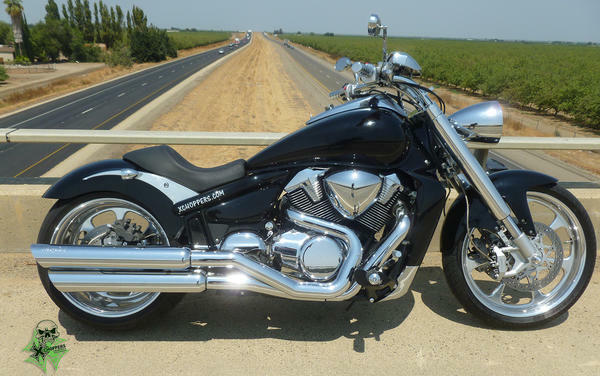 Xchoppers own M109 shown above with Stock Height Suzuki M109R Rear Suspension. Custom Equip. 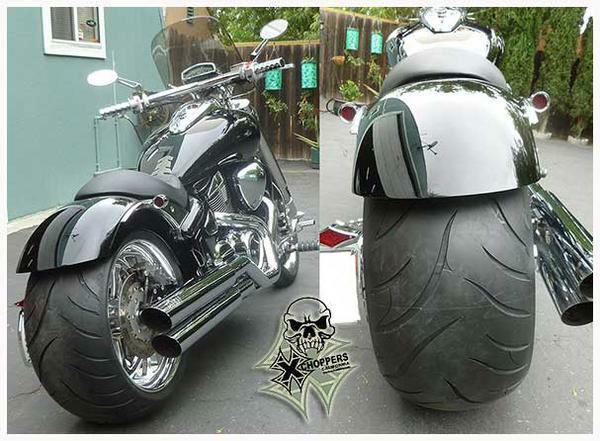 : Vance & Hines Big Shots, Sumo-X +6 degree triple trees, fat fork tube covers, Sumo-X Rear Fender, Seat, Struts, 21" front wheel, 10" wide rear wheel / Metzeler 280 tire, Custom 7" headlight. 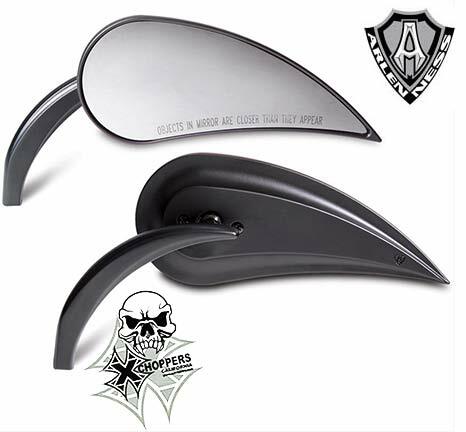 All parts shown are available from Xchoppers.com.